Anniversary of “Pinhibition” in Atlanta! Did you know that “pin ball” was formerly illegal in Atlanta? 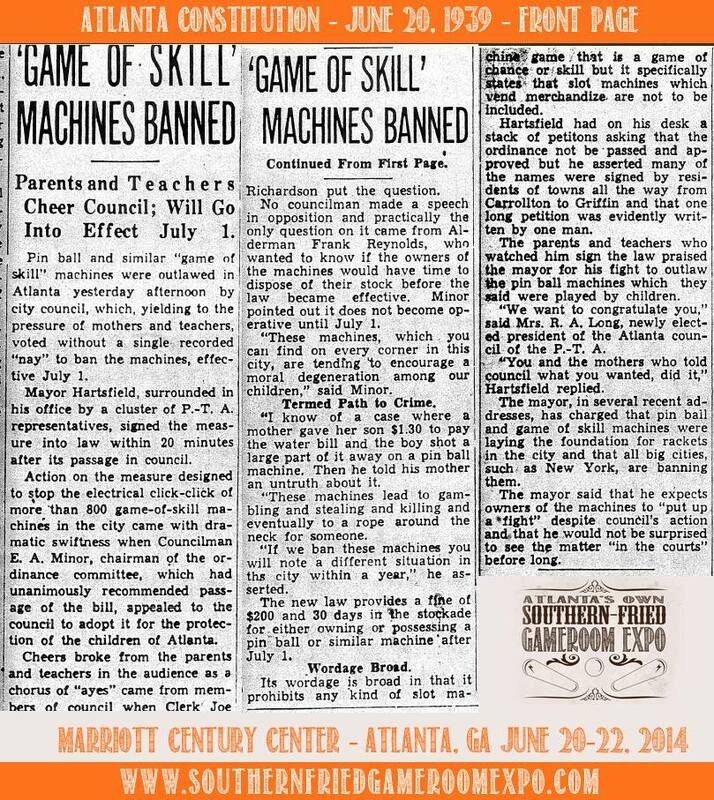 In fact, the newspaper article announcing the decision by the Atlanta City Council under Mayor William B. Hartsfield to make this “dangerous” game illegal was printed on the front page of the Atlanta Constitution newspaper on June 20, 1939! Check out the front-page scan from the original story below. Just weeks after the Japanese attack on Pearl Harbor in 1941, New York City led its own assault on the game of pinball. The Mayor of New York declared war on the city’s pinball machines on the grounds that they were gambling devices that siphoned money out of the pockets of children. Over the coming decades, the societal blemish known as pinball migrated underground and into the shadows of legality until Roger Sharpe famously called his own shot (thus proving it was not just a game of chance) in a demonstration pinball game before the New York City Council in 1976. While New York City rightfully gets held up as the city that banned pinball in 1941, it was not alone, as many major cities banned banned pinball during that era. In a move not surprising for a large city in the bible-belt, Atlanta, GA, made pinball illegal a full two years earlier in the third week of June in 1939. In a happy coincidence that almost certainly has the pinball gods smiling, Atlanta hosted the inaugural Southern-Fried Gameroom Expo on the 75th anniversary of Atlanta’s ban on the game of pinball. As you already know, the good news is that pinball is no longer illegal, and we have been celebrating the game that has made a significant comeback each year at the Southern-Fried Gameroom Expo. Experience for yourself the game that was once considered a “path to crime,” but is now fun for the entire family! We’re glad pinball is no longer a crime, because if it was, you’d have to lock us up and throw away the key!